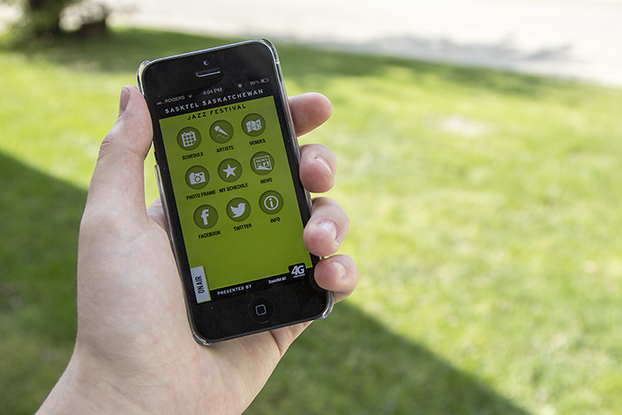 The Sask Jazz Festival app can be downloaded for free on the Android Marketplace or the Apple App Store. Now in its 27th year, the Saskatchewan Jazz Festival has grown to be absolutely massive. With a festival of this size and calibre comes a hefty fifty-page festival program — a good resource, but not exactly convenient to carry around. Fortunately for those of you with an Android or Apple device, you can get all of your festival information served up right on your smartphone with the festival’s free app. So, to help you prepare for the 2013 festival and make sure you’re up to speed with all the cool stuff that’s happening this year, we’ve put together a guide to getting the most out of the app. The most important part of the app is the festival schedule. It’s relatively straightforward, but it has a few quirks that you should keep in mind. Whether you plan to attend just a few shows during the festival or to attempt to attend everything, this app will be your best friend in keeping you up to date and on track. In the ‘Schedule’ section you will find a list of all the festival dates along with the number of concerts on each day (not counting free stages). Selecting a date will serve up a list of performance sorted by venue. You can then tap a specific artist performing that day, favourite that performance, read their bio, and check them out online. Hitting up the free stages is one of the best parts of the festival, so knowing when shows that you’re looking forward to are happening is pretty crucial. This information is available through the app, but when looking up performances at any of the free stages, things aren’t as smooth as they could be. At first glance, the free stages only show up in the schedule on the first day they are open. To find the full schedule, you have to navigate to the ‘description’ tab for the venue (in between ‘schedule’ and ‘links’). On the app’s home screen you’ll also find the ‘Venus’ section — another important part of the app. Selecting the venues icon will bring you to a list of all festival venues with their addresses. Screenshots of the Jazz Fest app, iOS version. From left to right: the home screen; the schedule page; a list of shows happening at the TD mainstage; and the My Schedule list of shows that have been ‘favourited’. You can get more info by selecting a venue and it comes at you in a couple of different ways. For example if you select 2nd Avenue Grill it takes you to the same free stage page mentioned above. To see the location of the venue on a map, tap the globe icon in the bottom right corner (bottom middle on iOS). If you select the Broadway Theatre it will take you to a schedule of events at that venue and there is an icon to see it on a map in the top right corner (again, bottom middle on iOS). There are a few venue pages with each of these two formats. Also note that according to the venue map Amigos is in Russia just north of Mongolia. As far as we know, Amigos is still located at 632 10th Street East. New this year and my own personal favorite part of the app is the ‘My Schedule’ area. When you ‘favourite’ a concert by tapping the star icon next to a show it is automatically stored in your schedule where they will be sorted by date. The downside of this feature is that there is no way to see the start times of events you’ve favourited. You will have to go back to the full schedule to check. However, word from the festival is that this will be updated over the next couple weeks. Once updated, this functionality will serve you well during the festival, especially with the ability to be notified 15 minutes before a show kicks off. Also new this year is the ‘Festival Photo Frame’ which will put the Jazz Fest logo on your photos and then save it to their gallery. It’s kind of like a heavily branded, festival-only Instagram stream. This section will not be usable until the festival begins on June 21. The app has some other straightforward stuff on it that you would expect, including links to festival news, Facebook and Twitter. Other features include the very handy ‘On Air’ tab at the bottom of the screen that will scroll events that are currently happening or starting soon. You can also find contact information for the festival and the app designers under the ‘Info’ section. The ‘Info’ section is also where you’ll find the option to purchase tickets to shows. With files from Bryn Becker.